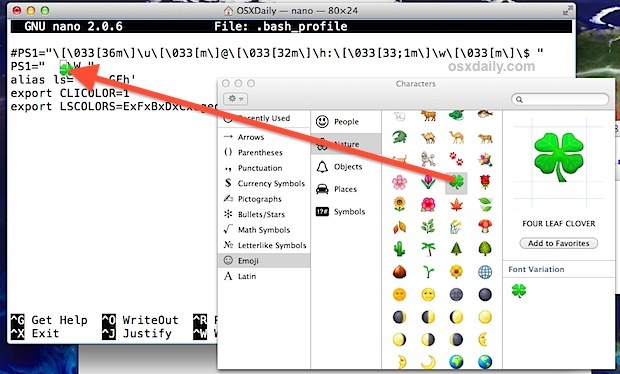 A very unique and amusing way to customize the bash prompt appearance is to add one of Mac OS X’s Emoji icons to transform the appearance of the prompt itself. This isn’t going to be the most practical tweak in the world on it’s own, but it is entertaining and because it’s using traditional methods of customizing the bash prompt you can make it as useful or useless as you want. The emoji tends to look best as a prompt when the Terminal font size is fairly large, perhaps larger than you’re accustomed to. This is particularly the case with complex emoji icons, but for basic icons like stars, shamrocks, and thumbs up the smaller fonts still look ok.
PS1="(drop emoji here) \W "
PS1="\W (drop emoji here) "
PS1="\u@\h (drop emoji icon) \W "
Remember to add a space (if not two) to after the Emoji or else it will be cramped against the command prompt. If this is a bit too outrageous for you, check out a guide to improve the overall Terminal appearance and another excellent trick to make it more readable by adding a separator between commands that have been executed. Yes, but the question is: why? Terminal is supposed to be useful and having an icon isn’t going to help that. Why not post some tips on how to actually make it work for the benefit of the user? I think it’s funny. Not for me, but I’m not going to pull a Woktej on ya. Mostly because it can be fun to customize things. We do have a lengthy category archive of tons of useful command line tips that directly benefit the user though. It’s actually a very easy and useful way to make it easy to see past command boundaries when you’re scrolling backwards. Like if you run a big compile and want to see the very first error that was generated. Wojtek, I bet your favourite colour is Beige. Have a little fun sometime. I think it’s actually very useful! If you select the right icon (colour-wise) it might help to see differentiate the prompt (as well as entered commands) from the cmd output. Is there any way to get alpha channel support for the emojis inside the terminal window? Mine is set to semi-transparent black, but the emojis don’t seem to support it, which means a square completely transparent box shows around them. Just looks ugly that way, that’s all. `export PS1=$(echo $PS1 | sed ‘s/\(. *\)\$/\1 🐹 $/’)` – one liner to tweak an existing `$PS1` which you can comment out.